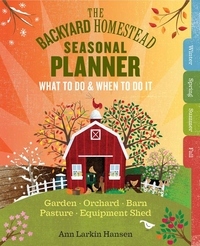 This hardworking addition to the best-selling Backyard Homestead series offers expert advice on what tasks to do around your farm and when to do them -- no matter where on the planet you call home. Author Ann Larkin Hansen sets the priorities for each area of the farm, including the barn, garden, orchard, field, pasture, and woodlot. For every critical turn of the year (12 in all), Hansen provides an at-a-glance to-do list along with tips and a more in-depth discussion of key topics for the season. Easy-reference charts, checklists, and record-keeping sections help you keep track of it all.